Taste Barolo, hunt for truffles, and hike through vineyards at the base of the Italian Alps. Join the Euro Travel Coach team on an exploration of one of our favorite parts of the world - Piedmont. Meaning "foot of the mountain," this beautiful region located in northwest Italy is home to the luscious wines of Barolo and Barbaresco, pungent white truffles, breathtaking scenery, and regal palazzi. It’s truly the ideal place for an Italian wine tasting holiday. We will eliminate all the hassles of traveling to ensure that you will be able to fully relax and enjoy all the pleasures Piedmont has to offer. We’ll go on a Barolo wine tour, dine at the best restaurants in Piedmont, and experience the culture of northern Italy. The only downside is, you won't want to leave! You'll be joined by 8-10 other travelers. Chelsea, Greg, and Betsy from the Euro Travel Coach team will serve as your hosts and will be available 24/7 to assist you during the trip. 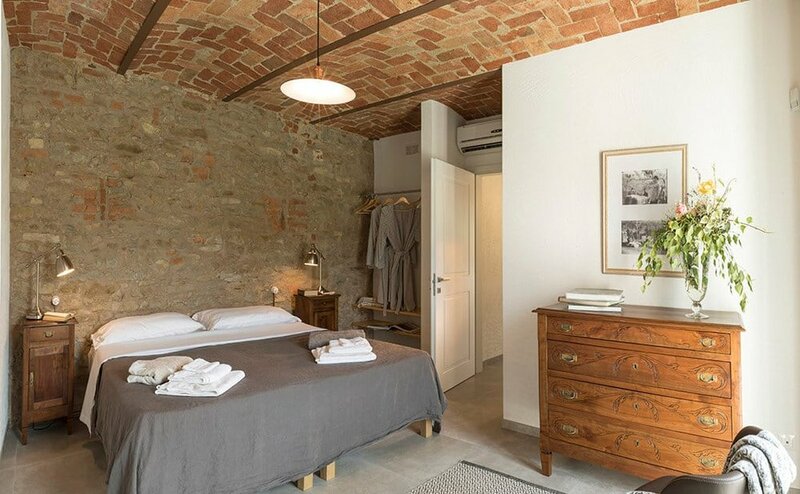 All seven nights of your trip will be spent in a beautiful villa located on an old Barolo winery. We will have the place all to ourselves, which will allow you to unpack, settle in, and truly feel like a local. Each room has it's own en-suite bathroom for your comfort. The property has a lovely pool, a sauna and a tennis court. In the mornings, we will provide a wonderful breakfast featuring local produce, meats, cheeses, and baked goods. The Euro Travel Coach team will be available to you throughout the trip to take care of all your needs, handle the logistics and answer any questions you may have along the way. In addition, on our excursion to Alba, we have carefully selected a local, licensed Piedmont tour guide who will lead us on a walking tour of the city. She is a knowledgable and entertaining guide who will point out the beautiful art, architecture, cultural marvels and local food that surround you and share fascinating stories of the city. She will also provide you with fantastic restaurant and shopping recommendations. During the truffle hunt, you’ll be escorted around the rolling hills of Piedmont by a truffle expert and his carefully trained dog, who will help you find some of Piedmont’s precious tubers. A member of our team will reach out to you in advance of the trip to assist with arranging transportation from the airport (additional fees apply). Upon arrival at the villa, you can explore the area or relax by the pool. A local chef will prepare a traditional, three-course Piedmontese meal to welcome you to Italy. During dinner you can sip on a selection of local wines and get to know your fellow travelers. Following breakfast at the villa, we'll head to the white truffle capital of the world, Alba. You'll be shown around the city by a local guide who will share the history of the city and show you around the bustling piazzas and pedestrian streets. After the tour, you'll have time to explore on your own, perhaps stopping by the International Truffle Festival to admire the treasured funghi on display (extra fees apply). The day will conclude with an Italian cooking class back at the villa. You'll learn how to make 'plin' pasta among other Piedmontese delights. Following breakfast at the villa, you'll be driven to the quaint hilltop town of La Morra where you can wander the cobblestone streets. From here, we will hike through the vines to Palas Cerequio, an ancient village turned luxury resort where we will enjoy a delicious lunch. Afterwards, we will continue our hike, ending in Barolo. You can explore the many wine shops in town and enjoy the lovely views from the terrace of the town's imposing castle. Then, you'll be treated to a tasting of wines from the Piedmont region along with a selection of local cheese and charcuterie at Enoteca La Vite Turchese. In addition to wine and truffles, Piedmont is famous for their Hazelnuts. In fact, Nutella was invented in Alba! On this day, we'll hike to Cascina Barroero to learn about Hazelnut farming first hand. On the guided tour of the property, we'll learn about the harvesting, shelling, and baking processes, then enjoy a lovely lunch featuring hazelnuts and other products from the farm.. After, you'll have the chance to visit a winery before heading back to the villa for a light dinner. If you’re anything like the Euro Travel Coach team, you will be sad to leave the vine covered hills of Piedmont. We’ll make it as easy on you as possible by preparing a farewell brunch (depending on your flight time) and assisting you with arranging a transfer to the Milan or Turin airport (additional fees apply). Once you’re at the airport, you can start planning your next trip to Italy!!! INTERESTED IN EXTENDING YOUR TRIP TO ITALY? INQUIRE ABOUT OUR TRAVEL CONSULTING SERVICES! GROUP TOUR PARTICIPANTS WILL RECEIVE A 20% DISCOUNT ON TRIP PLANNING. Casa Visette, our home during the Small Group Tour of PIedmont, Italy! Barolo wine and pasta will be shared here! 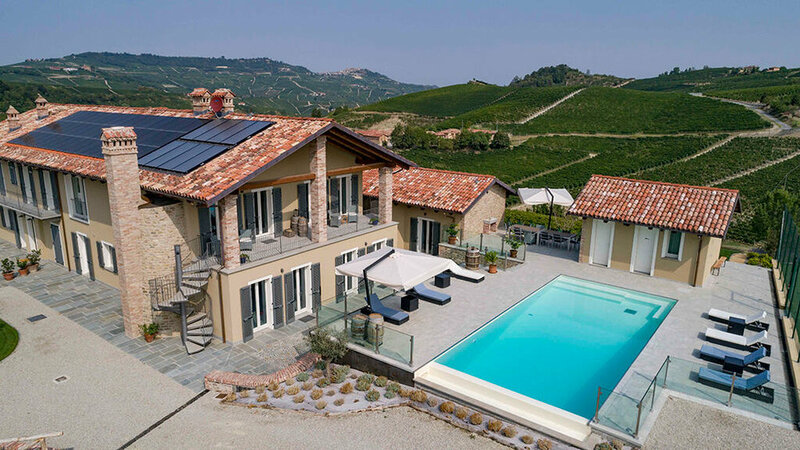 The pool overlooking the Barolo vineyards. The elegant furnishings in Piedmont. Every room has an ensuite bath. Beautiful setting in the hills of Piedmont.